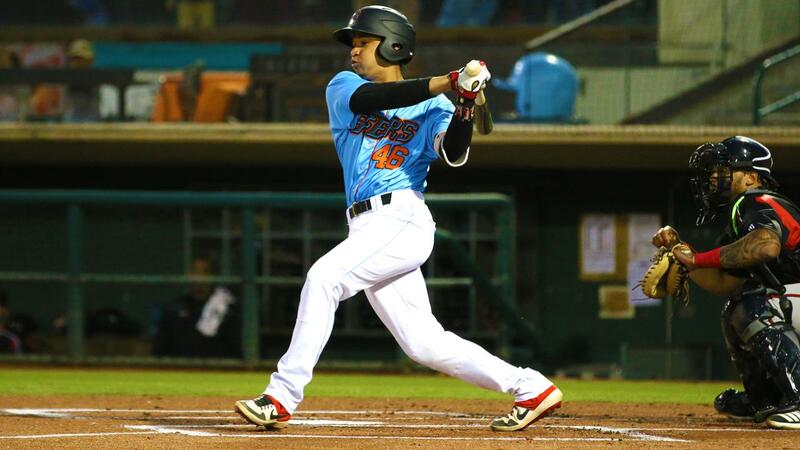 SAN BERNARDINO, CA- The Inland Empire 66ers of San Bernardino were shutout on Friday by the Lake Elsinore Storm 4-0 and have now been stymied by the Padres affiliate for the last 16 innings. The Sixers fell to 0-2 on the young season as Lake Elsinore got a strong pitching effort from Padres top pitching product MacKenzie Gore (1-0). After the Inland Empire starter Kyle Bradish (0-1) tossed a perfect first, he was touched for two runs in the second with a RBI single from Storm (2-0) shortstop Gabriel Arias and a sac fly from left fielder Robbie Podorsky. The righty from New Mexico State was charged with the loss in his professional debut. Meanwhile Gore was rolling as the 20-year-old fanned eight batters and allowed just four hits and one walk in five frames in his Cal League debut. The Storm tacked on a run in the seventh on Eguy Rosario's solo homer to left field. The dinger came off Sixers reliever Cooper Criswell, who like Bradish, was making his professional debut. The righty from the Univ. of North Carolina was strong however as he struck out six batters with no walks over four frames. Franklin Torres had two hits for Inland Empire as the Sixers tallied seven hits (all singles) against the shutout-earning trio of Gore, LHP Travis Radke and RHP Caleb Boushley (SV, 1). Luis Campusano and Gabriel Arias each notched three-hit nights for the Storm. Inland Empire put two on in the ninth with two outs but Podorsky ran down a liner to the gap in left-center off the bat of Kevin Williams Jr. to end the game with a dazzling play. The series continues Saturday at 6:05 pm. The contest can be heard live at 66ers.com.